Almost any shape, style or logo can be reproduced. The only limit is your imagination. The total quantity order may be made up of Gold, Silver and Bronze. Gold and Silver come in two finishes, Antique and a Bright – 24 carat finish. There is an additional 10% Charge on the Bright Gold Finishes only. The colour of Black Nickel is also available for an Optional Placement colour finish. 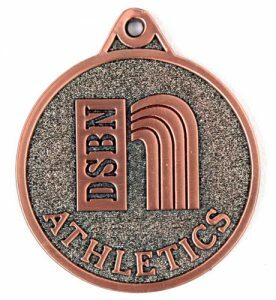 The medals are quality finished in deep cut, high relief one side, with a polished engravable surface on the other. 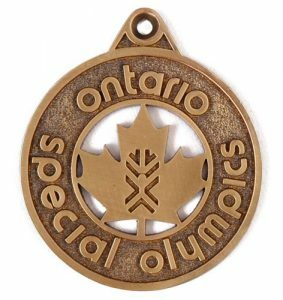 The Cast Medallions can be moulded on two sides for a Flat Mould charge of $24.00 per design. 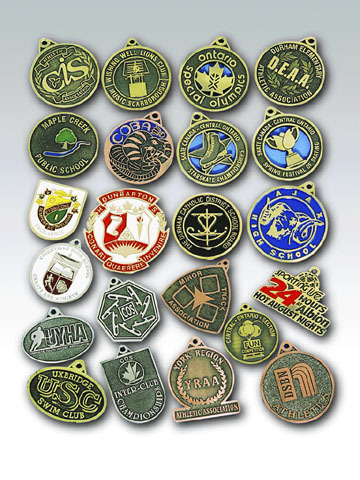 Base price of the Double Sided Cast Medallion remains the same as the regular One-Sided Cast Medallion. 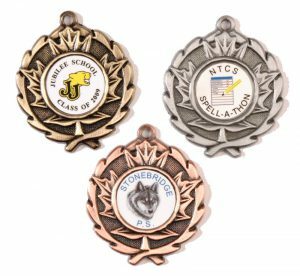 Extra medals may be purchased at no extra charge without loops for use on plaques and special awards. Please see our artwork submissions section to learn more about supplying Baldwin Sales with custom artwork. Prices subject to quotation.